In what has become a deeply unwelcome summertime tradition, Floridians are once again finding their waterways befouled with blue-green algae. Since June, an algae bloom of epic proportions has gripped Lake Okeechobee, the largest freshwater lake in the state. By last week, the bloom had engulfed 90 percent of the lake’s open water (436 square miles), according to satellite data analyzed by the National Oceanic Atmospheric Administration (NOAA). The algae are also invading the St. Lucie River and estuary to the east and the Caloosahatchee River and estuary to the west, which are connected to Lake Okeechobee via canals. On Monday, Florida Governor Rick Scott declared a state of emergency in seven coastal counties threatened by the slime. 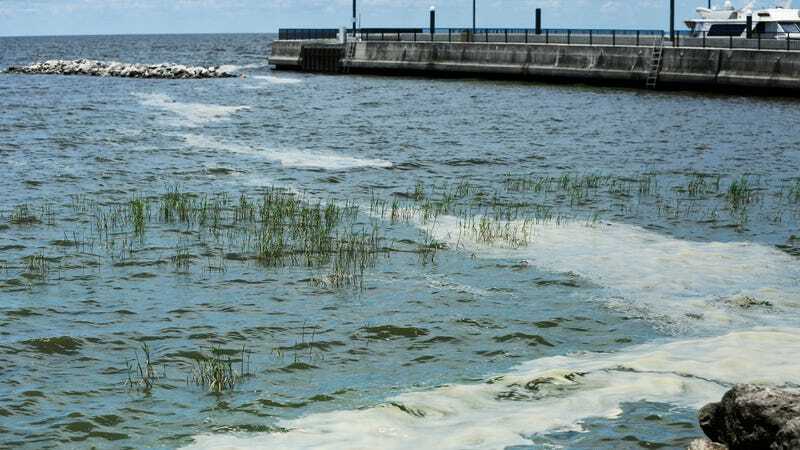 Algae blooms have become a regular summertime occurrence along Florida’s coastlines and in Lake Okeechobee, a vital reservoir that supplies drinking water to locals and irrigates the state’s $1.5 billion agriculture industry. That same industry deserves a good share of the blame: According to the Miami Herald, nitrogen and phosphorus runoff from farms, along with leaky septic tanks, are essentially dumping copious amounts of fertilizer into the lake. Hurricane Irma, which struck Florida last September, is also partly to blame for causing nutrient-laden watersheds north of the lake to overflow and supercharge this year’s blooms, according to Florida Sea Grant director Karl Havens. Combine all those nutrients with hot summer days and loads of sunshine, and you get ideal conditions for algae to thrive. The blooms don’t just look and smell disgusting, they can be dangerous. As Florida’s Department of Health notes on its website, some blue-green algae produce cyanotoxins that can affect the skin, liver, and nervous system at high enough concentrations. A press release issued by the DOH in June reminded beachgoers that swimming in algae-laden water “may cause ear, eye and skin reactions, and hay fever and flu-like symptoms” including diarrhea. While there’s no easy fix—as the Miami Herald notes, even if the agricultural industry were to clean up all its pollution today, mud at the bottom of the lake has become so nutrient-laden it can potentially fuel blooms for years to come—reducing the lake’s discharges to the east and west would certainly provide some relief along Florida’s coastlines. Trouble is, the U.S. Army Corps of Engineers is currently forced to discharge water whenever the lake level gets too high, in order to prevent a breach of the dike humans built to contain the lake (and keep it from spilling over onto the settled agricultural lands to the south) in the mid 20th century. But there might soon be a better option. For years, environmentalists and many Floridians have been pushing an Everglades restoration plan that seeks to move more water south from Lake Okeechobee into freshwater-starved wetlands. On Tuesday, to the cheers of politically-expedient environmentalist Rick Scott whose policies many Democrats and environmentalists say exacerbated the crisis, the White House approved a crucial piece of that project—a reservoir that’ll send an an extra 370,000 acre-feet of water to the Everglades each year. The reservoir is expected to reduce discharges to the east and west of Lake Okeechobee by 63 percent, according to the South Florida Water Management district. That could make a serious dent in the coastal algae problem. “After 18 years of unnecessary delay, Florida is finally poised to move forward with the solution that scientists and policymakers alike have long known is indispensable to significantly reducing the scourge of algae-causing discharges of Lake Okeechobee water and vital to sending water south,” Everglades Foundation CEO Eric Eikenberg told Earther in an emailed statement. The reservoir isn’t a done deal yet: Per E&E News, the Senate still needs to put the project in a water infrastructure authorization bill it’s expected to take up this summer. For now at least, the slime ain’t going anywhere.